Today, in this age of terrorism — and even the threat of nuclear attack from North Korea — fear has become top of mind, again. Creating an atmosphere of dread is the goal of terrorists and dictators. It’s easy to say, “I can’t live my life in fear” and then pretend to go about your business. But, even if you bravely brush the fear aside — in the background the nervous “look-over-your-shoulder-to-be-sure” feeling remains. But how do we genuinely, in our hearts and minds, overcome fear? 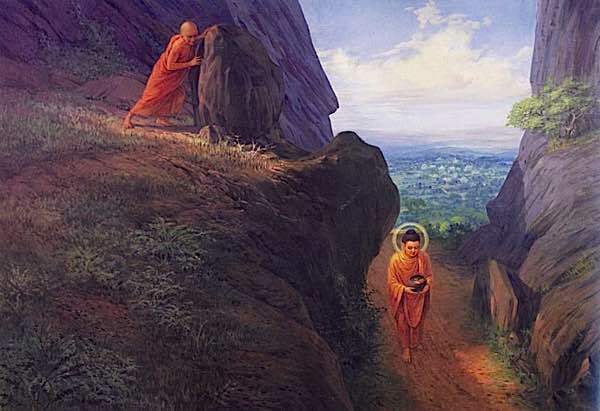 What did Buddha teach on overcoming fear? 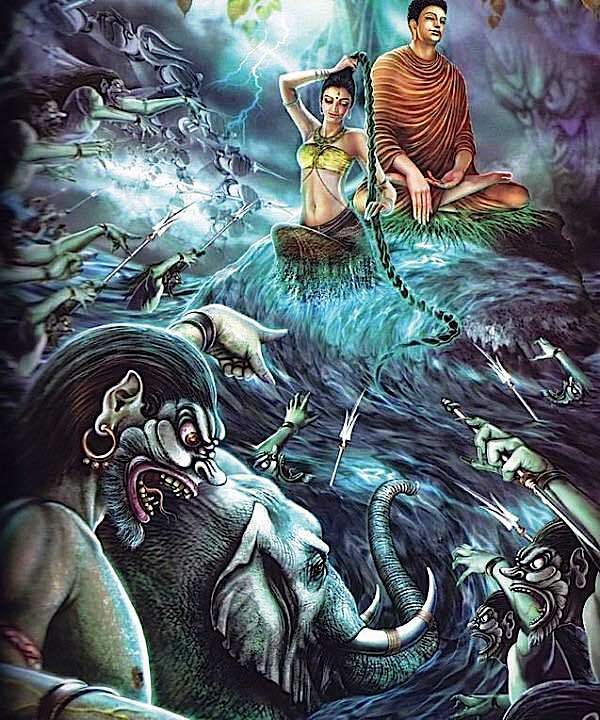 Buddha faced down not only Mara (inner demons), but also his own cousin Devadatta (who tried to kill Him more than once), charging elephants, Brahmins and falling rocks and other dangers. Iconic of His fearlessness is the hand held up in the Abhaya mudra. Who was this person, not afraid of death? Shakyamuni Buddha meditated under the Bodhi Tree, ultimately attaining enlightenment. He wrestled with temptations, demons, and vile cravings. Mindfully watching these cravings or thoughts as an observer can help the meditator, ultimately, conquer obstacles. Another iconic image of Buddha’s fearlessness, is the story of the rampaging elephant, enraged by wicked Devadatta. With loving kindness, and a fearless disposition, Shakyamuni instantly subdued the great beast. Devadatta tried to kill Buddha more than once, always failing. The Abhaya mudra — the famous gesture of the Buddha holding up his hand fearlessly (seen in many images of the Buddha) — expresses Buddhist fearlessness in profound simplicity. The Enlightened Mind has no fear. But what about the rest of us? For us, those of us not Enlightened, we can take refuge in the Buddha. 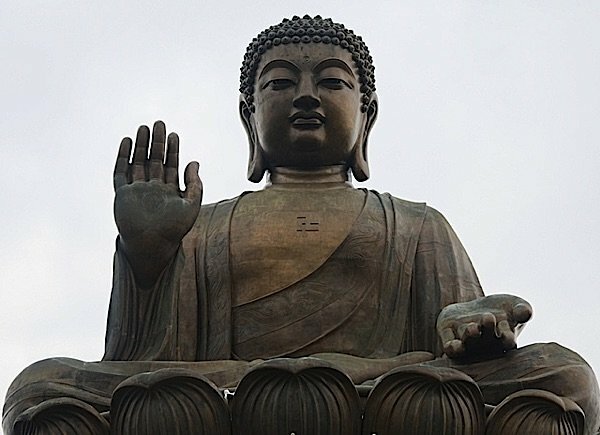 Abahya Mudra (hand gesture) expresses Buddha’s fearlessness. 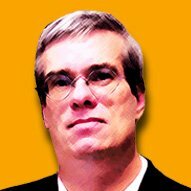 Who is this Person, Not Afraid of Death? Thich Nhat Hanh, the great Zen teacher, not a stranger to danger, explained one of the remedies to overcome fear. He explained how understanding Oneness (Emptiness) and Dependent Arising helps us overcome fear: “The fourth notion to be thrown away is the notion of life span. We believe that we are born at one point in time, that we will die at another point in time, and that between is our life span. Most of us believe we’ll spend seventy, eighty, ninety, one hundred years on this planet and then we’ll be gone. When we look deeply, we see this is a wrong perception. In our minds, to be born means that from nothing we became something; to die means that from something we become nothing; and from someone we become no one. The problem with the difficult and misunderstood concept of Oneness (Emptiness) and Dependent Arising is that it can take years of meditation to grasp them sufficiently to overcome fear. A more pragmatic view of fearlessness is found in the Abhaya Sutta, the “Fearless” Sutra — a discourse between the Blessed One and Janussoni the Brahman who challenged Buddha with his view “no one who, subject to death, is not afraid or in terror of death.” The Buddha answers him with four “cases” of people who would die in fear, and four who would die without fear. Devadatta unsuccessfully tries to kill Buddha — again — this time with a rock. It’s easy to understand the notion that a good person will receive a reward —good Karma leading to good rebirth as a Buddhist belief. Yet, Buddha made it clear in the same Sutra, that the real key to freedom from fear is the person “who has abandoned passion, desire, fondness, thirst, fever, and craving for sensuality.” This person has lived the Eightfold Path, taught by Buddha, based on the Four Noble Truths. This person, who has removed attachments and craving, has no reason to fear. If you don’t feel attached to illusory enjoyments, you don’t fear losing them. In all, Buddha gave examples of four types of people who are free of fear. The journey away from fear is a lifetime one — not an overnight revelation. Buddha lived for eighty-years and died without fear. His followers likewise spent lifetimes living the eightfold path. At what point does fear completely disappear? In the case of Shakyamuni Buddha, that happened under the Bodhi Tree when he achieved Enlightenment. For us, we might not fully achieve fearlessness until we achieve significant realizations, or even Enlightenment. 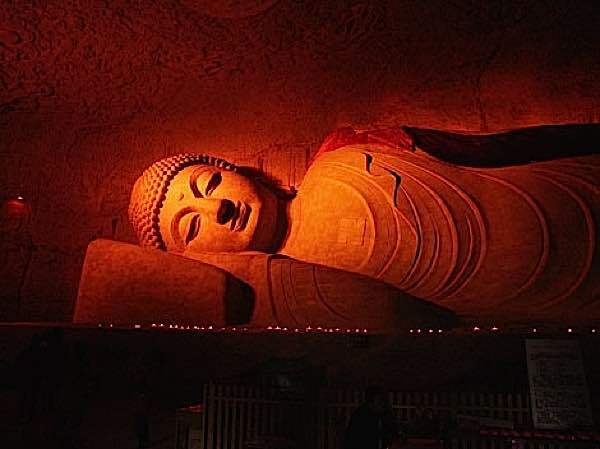 Buddha passed peacefully into paranirvana — with no fear. Yet, there are degrees of fear. The person who has “mostly” abandoned attachments and cravings for sensualities could probably be said to be “mostly” free from fear. The person, like the “good person” Buddha described, could also feel fulfilled, happy and content, and therefore mostly free of fear. 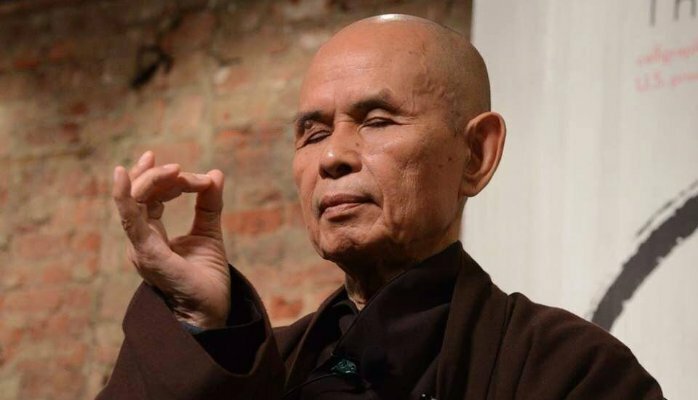 Thich Nhat Hanh explained that being in the present moment, letting the past go, not worrying about what might come in the future, is the secret to fearlessness. The past is gone. The future isn’t here yet. If you dwell only in this moment, in this second, there is no fear. You can’t fear the future if you’re not thinking of the future. You can’t fear the loss of past memories if you’re putting aside the past. Mindfulness is a state of “observation” — you observe your own breath, your own mind, your own body, your own actions in the present moment only. If your mind is plagued with fear, mindfulness meditation allows you to detach and observe the thoughts, analyze them, become your own teacher. For example, let’s say you are afraid of thunder storms. Right now, in this moment, your house is shaking with the rumble of a ferocious storm. Wind lashes your house, the trees beat your roof, the windows shake. Instead of turning on the television full blast, and trying to “forget” the storm outside, Buddhist teachers might suggest you sit in meditation, listen to the storm, hear every sound, watch and observe your own fearful thoughts. See the panic. Watch and observe in as detached a way as possible. Stay only in the present. Observe your own breath, how fast and fearful it seems, but don’t judge — simply observe. The simple act of observation, in the present moment, almost immediately slows your pulse rate, your breath and your racing, fearful thoughts. The key to successful mindfulness is detached observation. When you first start observing your fear, you’ll still feel entangled in it. But observe even that entanglement. Don’t try to remove the entanglement, or analyze it, or destroy it — simply observe it. 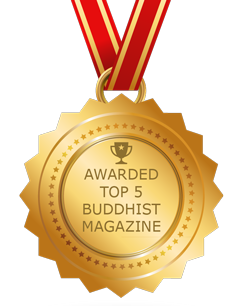 Taking refuge in the Three Jewels, as explained by Thich Nhat Hanh, is taking refuge in your own Buddha Nature. This is a strong remedy for fear. If you understand your Buddha Nature, or the concept of Oneness with all beings, there’s no reason for fear. Most of us aren’t that advanced. Until we are, at least in Vajrayana and Mahayana, we can rely on meditative deities, who are expressions of the inner Buddha Nature — your Buddha within. If you practice deity meditation methods, where you visualize yourself as an Enlightened Deity, fear automatically seems to drop away. Reciting it over and over, during a nerve-wracking event, is a kind of formulated mindfulness. 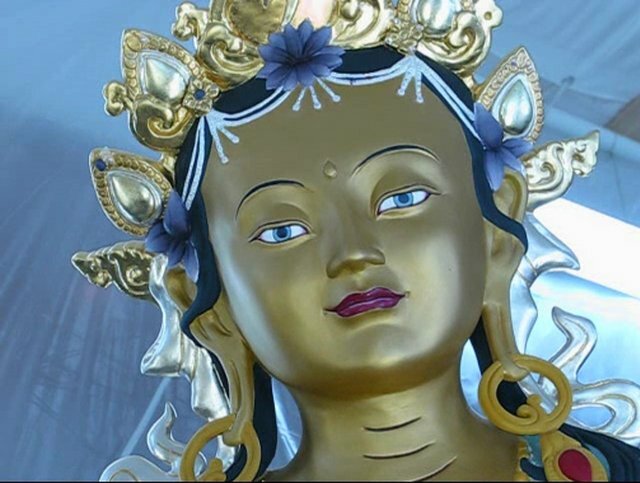 By staying focused on Green Tara, and her active aspect as a rescuer, you are focusing on your own inner Buddha Nature. The definition of mantra is “protection for the mind.” Mantra works at the level of your own mind. Since fear is inside your mind, and Tara is inside your heart, and the mantra is on your speech, this can be a very powerful way to calm yourself in the face of terror or fear. The Blessed One said: “Brahman, there are those who, subject to death, are afraid and in terror of death. And there are those who, subject to death, are not afraid or in terror of death. “And who is the person who, subject to death, is afraid and in terror of death? There is the case of the person who has not abandoned passion, desire, fondness, thirst, fever, and craving for sensuality. Then he comes down with a serious disease. As he comes down with a serious disease, the thought occurs to him, ‘O, those beloved sensual pleasures will be taken from me, and I will be taken from them!’ He grieves and is tormented, weeps, beats his breast, and grows delirious. This is a person who, subject to death, is afraid and in terror of death. “Furthermore, there is the case of the person who has not abandoned passion, desire, fondness, thirst, fever, and craving for the body. Then he comes down with a serious disease. As he comes down with a serious disease, the thought occurs to him, ‘O, my beloved body will be taken from me, and I will be taken from my body!’ He grieves and is tormented, weeps, beats his breast, and grows delirious. This, too, is a person who, subject to death, is afraid and in terror of death. “Furthermore, there is the case of the person who has not done what is good, has not done what is skillful, has not given protection to those in fear, and instead has done what is evil, savage, and cruel. Then he comes down with a serious disease. As he comes down with a serious disease, the thought occurs to him, ‘I have not done what is good, have not done what is skillful, have not given protection to those in fear, and instead have done what is evil, savage, and cruel. To the extent that there is a destination for those who have not done what is good, have not done what is skillful, have not given protection to those in fear, and instead have done what is evil, savage, and cruel, that’s where I’m headed after death.’ He grieves and is tormented, weeps, beats his breast, and grows delirious. This, too, is a person who, subject to death, is afraid and in terror of death. “Furthermore, there is the case of the person in doubt and perplexity, who has not arrived at certainty with regard to the True Dhamma. Then he comes down with a serious disease. As he comes down with a serious disease, the thought occurs to him, ‘How doubtful and perplexed I am! I have not arrived at any certainty with regard to the True Dhamma!’ He grieves and is tormented, weeps, beats his breast, and grows delirious. This, too, is a person who, subject to death, is afraid and in terror of death. “These, Brahman, are four people who, subject to death, are afraid and in terror of death. “And who is the person who, subject to death, is not afraid or in terror of death? “There is the case of the person who has abandoned passion, desire, fondness, thirst, fever, and craving for sensuality. Then he comes down with a serious disease. As he comes down with a serious disease, the thought does not occur to him, ‘O, those beloved sensual pleasures will be taken from me, and I will be taken from them!’ He does not grieve, is not tormented; does not weep, beat his breast, or grow delirious. This is a person who, subject to death, is not afraid or in terror of death. “Furthermore, there is the case of the person who has abandoned passion, desire, fondness, thirst, fever, and craving for the body. Then he comes down with a serious disease. As he comes down with a serious disease, the thought does not occur to him, ‘O, my beloved body will be taken from me, and I will be taken from my body!’ He does not grieve, is not tormented; does not weep, beat his breast, or grow delirious. This, too, is a person who, subject to death, is not afraid or in terror of death. “Furthermore, there is the case of the person who has done what is good, has done what is skillful, has given protection to those in fear, and has not done what is evil, savage, or cruel. Then he comes down with a serious disease. As he comes down with a serious disease, the thought occurs to him, ‘I have done what is good, have done what is skillful, have given protection to those in fear, and I have not done what is evil, savage, or cruel. To the extent that there is a destination for those who have done what is good, what is skillful, have given protection to those in fear, and have not done what is evil, savage, or cruel, that’s where I’m headed after death.’ He does not grieve, is not tormented; does not weep, beat his breast, or grow delirious. This, too, is a person who, subject to death, is not afraid or in terror of death. 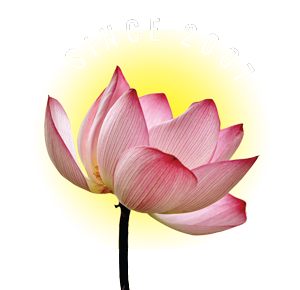 “Furthermore, there is the case of the person who has no doubt or perplexity, who has arrived at certainty with regard to the True Dhamma. Then he comes down with a serious disease. As he comes down with a serious disease, the thought occurs to him, ‘I have no doubt or perplexity. I have arrived at certainty with regard to the True Dhamma.’ He does not grieve, is not tormented; does not weep, beat his breast, or grow delirious. This, too, is a person who, subject to death, is not afraid or in terror of death.